Mom, the Intern: A book about dead bodies. Whaaaa? A book about dead bodies. Whaaaa? I'm weird (news flash). If you've been reading this blog for any amount of time, you know that. Perhaps the weirdest thing about me is my dichotomous feelings about death. I'm both terrified of it and fascinated by it. I guess the deal is, I'm highly interested in the mechanics and science of death, but I don't exactly want it happening to me or anyone else. Catch my drift? Mary Roach, the author of Stiff, is a character, that's the first thing you need to know. This is NOT a serious book. Well, it is, as books about dead bodies are wont to be. But the tone is not. Roach is funny and light-hearted without being disrespectful. She says what's on her mind. She's a fearless journalist who isn't afraid to ask the difficult, disgusting questions. And for that matter, she's just plain fearless. I don't know anyone who would voluntarily walk around the University of Tennessee's Forensic Anthropology Center (aka "the Body Farm") or watch someone being embalmed for fun -- I mean, research. But Roach would, and has. Did you know that embalming fluid is red, so as to make the person look "alive" as if they were still full of blood? And sometimes, you can look too young after you've been embalmed, so they have to paint wrinkles on you? Did you know that in the first stages of decomposition, the skin of the hands and feet starts to slip off of the bones? Did you know that doctors used to pay people, called "body-snatchers", to exhume the remains of the freshly dead so they could research the human body? This was before it was considered noble to donate your cadaver to science. Did you know they sometimes use cadavers to run safety tests on vehicles? In other words, they are real-life crash test dummies. Did you know that the human heart can actually jump out of a doctor's hands while its being removed for a transplant? Anyway, I really enjoyed this book. But as I read, I kept thinking of all the people in my life who probably should never read it. It's definitely a lot to stomach at times and it's not for the faint of heart. And I don't recommend snacking while reading it, if that's the type of thing you like to do. 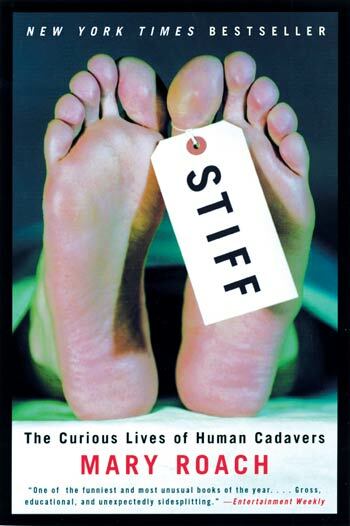 However, as wince-inducing as it is at times, Stiff is enlightening. Roach makes a great case for donating your remains to science. Cadavers are really necessary for scientific advancement. We need them to properly understand anatomy, medicine, forensics and the effects of physics on the human body. Basically, they're crucial to the progress of humankind. Roach says, and I agree with her, that cadavers are heroes because they solve murders, make medical breakthroughs and help us make cars safer. And the ones whose organs are used for transplants really do save lives. All the while, they just lay there and never complain because they can't feel pain. It's pretty awesome. I'm not sure what I want done to me when I die (I am an organ donor, however). But this book certainly made me think. In a (sick, morbid) way, research cadavers get to keep on living a little while longer than the rest of us. And that's kind of cool. I've always wanted to work on a cadaver and would probably be one to voluntarily walk in and watch the process. It sounds like a book I may (weirdly) enjoy. Thank you for posting this. I think I just found a new book I have to buy. I was surprised at how expensive cadavers are like for colleges and I really enjoyed the chapter about the plastic surgeon symposium and the declicate little cuts to practice. "Did you know that doctors used to pay people, called "body-snatchers", to exhume the remains of the freshly dead so they could research the human body? This was before it was considered noble to donate your cadaver to science." I knew this one!!! I think the book sounds pretty interesting actually. Maybe your weird in a more normal way than you think. Ugh, you're not your. Sorry, that was going to drive me nuts. Well you're brave! I could never read something like that. I watched some youtube videos about "illuminati" and had to call a friend to come over and sleep in the bed with me. Glad you enjoyed that read, though! I love books like this too!! I remember watching a documentary years ago about the Body Farm. Anyways, another book I would suggest is "Dead Men Do Tell Tales" by forensic anthropologist William Maples. It didn't go into all the gory stuff but still very interesting especially from a historical standpoint. Some of the chapters covered President Zachary Taylors death and the murder of the Russian royal family during the Russian Revolution. Very interesting. I had a friend in college who worked at a morgue part time. He told me some crazy stuff. Like that deceased people can still pass gas and open their eyes. I would seriously flip out! My husband worked at a mortuary before and after his mission, so I've heard some crazy stuff too! I am also fascinated with what happens to bodies after death. Have you checked out the mummies of Palermo Italy? Google Rosalia Lombardo, the "sleeping beauty." Crazy. Go find the National Geographic 'Taboo' episode that talks about the body farm! Its fascinatingly disgusting! I think it was titled something like "disgusting jobs" and I think Roach was the one being interviewed in it. Good stuff! I actually read this book a couple of years ago and LOVED it. Mary Roach also has a column in the Readers Digest. She is an extremely entertaining writer. If you are still interested in death, there is an interesting documentary on Netflicks.